Website will be updated shortly. Stock up on everything you need for your kids from maternity to pre-teen at 50-90% off retail. We gladly accept cash, Visa, Mastercard, Discover and American Express. 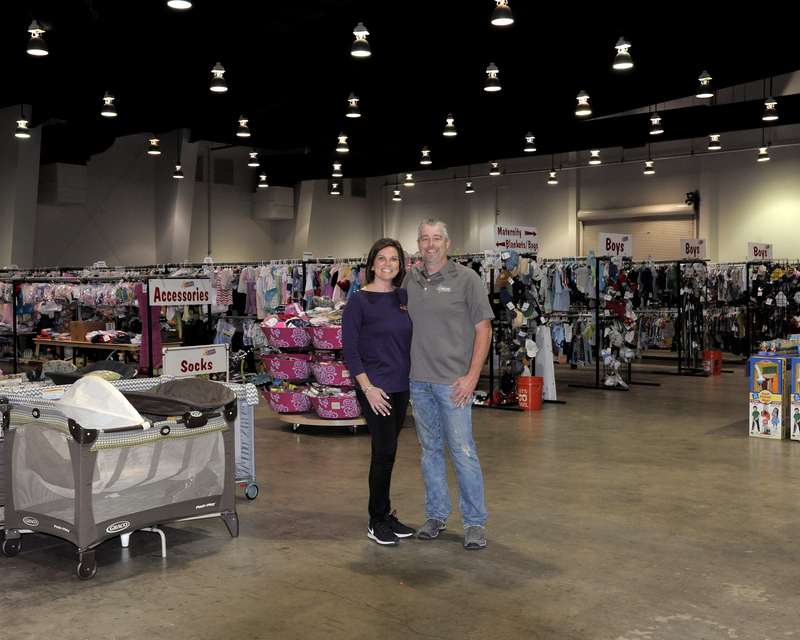 Shop 36,000 square feet of bargains - organized by size, gender and category. We provide a shopping bag, a hold area and you can shop 'til you drop! Click on the links below for tickets. Tickets required for volunteers/sellers & Special quest. *No children, strollers or baby carriers allowed (unless worn or carried by an adult) on this day, before 7:00pm. Children are allowed after 7pm. $3 admission fee-Friday only, click GET TICKETS HERE for a free pass. NEW MERCHANDISE BROUGHT IN ON FRIDAY! Sunday, March 24th: 1/2 Price Day! EARLY BIRD PRESALE 11:00am $5.00 at the door. Take the Military/Scyene exit off of I-635, we are beside the Hampton Inn. To be able to sell certain items at one time and to donate what doesn't sell. I donate the majority of my child's clothes because preparing them for the sale is a lot of work and I don't make much money off of them. "I love feeling like we are being good stewards of our money. Not only are we helping someone be able to provide good, clean clothing and toys for their children, but also we are able to purchase great things for great prices for my grandbabies. I say ""we"" because it is a family affair. My two daughters and I volunteer and shop together so it's a sweet memory for us as well! We also enjoy the fellowship with people we see twice a year. Love the owners who guide us as we volunteer and shop. Can't imagine why more people don't take advantage of this fantastic event!" Want to sell your items & make some money?